In Day 3, Senate Democrats refused to back down on their fight to release so-called committee confidential documents. Senators Booker and Hirono both released “committee confidential” documents related to Kavanaugh’s record on racial profiling and his disdain for the Office of Native American Affairs and programs that target indigenous populations. Senator Blumenthal and others went on to reserve their right to release any documents before any confirmation vote and called on fellow senators to do the same. 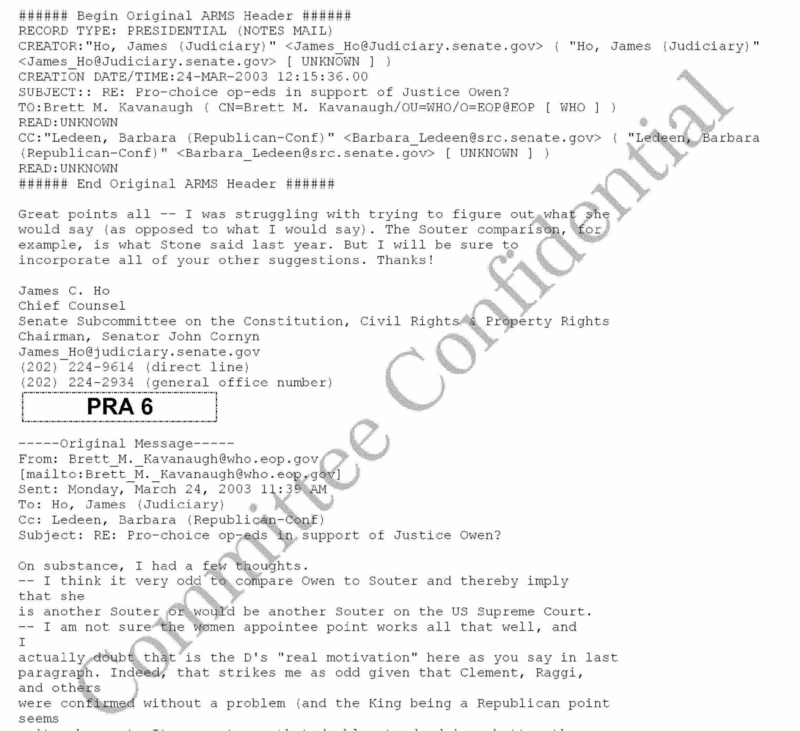 Meantime, the New York Times also published several “committee confidential” documents this morning that show Kavanaugh’s troubling thoughts and statements on several issues including, Roe v. Wade, racial profiling, affirmative action, and campaign finance . Roe as Settled Law: Leaked emails show that Kavanaugh suggested that a future Supreme Court could, and would, overturn Roe. Based on his previous rulings it appears that he could now be one of the Justices to do so. Pickering Nomination: During his 2006 nomination hearings Kavanaugh claimed not to have been involved in the confirmation of a highly controversial nominee to the 5th Circuit. Documents now show that Kavanaugh was much more involved than he previously testified. It is inappropriate and alarming that a nominee to the U.S. Supreme Court would lie under oath to the Senate. If Kavanaugh has been willing to skirt the truth on the above issues why should the American public take what Kavanaugh says at face value? Yesterday, a new report from the Brookings Institution examining reasons why Kavanaugh must recuse himself from cases surrounding Trump and potential criminal charges under current precedent. Senator Whitehouse pressed Kavanaugh on this very precedent today and refused to allow Kavanaugh to dodge his questions surrounding improper influence and actual or perceived bias. We must continue to engage with senators about postponing further consideration on this controversial nominee until the American people can see and assess all the documents related to his work on critical issues. The stakes are far too high for our nation and our rule of law to allow a vote to go forward when the record is incomplete, when senators are unable to provide advice or consent, and when the circumstances surrounding this nomination beg questions as to whether a potential constitutional crisis is underway. Is William Barr Serving the Public Interest or the President’s?